This time of year brings thoughts of hot apple cider, mesmerizing camp fires, brilliant shades of oranges and reds, and of course a garden that appears to be dormant and dull. A complete 180 from the spring and summer months. But I am here to tell you quite the opposite. Your garden and backyard landscape are full of activity and promise during the upcoming colder months. It only takes a change of perspective to appreciate the cold weather garden. Autumn is when gardeners start the process of preparing their outdoor rooms to overwinter, and preparing for early spring blooms as well. This is, of course, the time to plant spring flowering bulbs. But it’s also the time to dig up and protect your tender summer flowering bulbs and rhizomes (root stalks). Store them somewhere safe like a garage or basement, and replant them next spring once the ground has warmed. Perennials are cut back and discarded. However, gardeners might try something different this year. Grasses and other plants with feathery plumes look quite stunning with a cover of frost or snow. Maybe leave these to be cut in very early spring so that the stems and tufts remain all winter. This is not only beautiful, but it also plays an important role in overwintering beneficial insects. Did you know that many native bees actually burrow into pithy stems of herbaceous plants and hibernate? They emerge in early spring and begin their pollinating journey once again. Some species of bees also overwinter in the ground and inside cavities of woody branches and trunks. Some even hibernate in compost. In other words, if you completely clean out your gardens of debris and cut back plants to the ground, you may be killing off some of next year’s bees and other pollinators. Caterpillars also overwinter in your garden. Some species actually drop from the native trees in your yard and fall into the leaf litter on the ground. They build a protective cocoon within the leaves and wait until spring to emerge and begin the next stage of their lives. Leaves also decompose and provide nutrients back into the soil: the carbon cycle at work. Let’s not forget about the birds. Many of the native grasses, shrubs, and trees offer food sources for birds and other wildlife. Dead stems and branches also provide material for nesting. Some of my favorite shrubs like winterberry and beautyberry provide berries throughout the fall and winter months and also look amazing in the sleeping garden, especially against a backdrop of evergreen trees. It just so happens that this is the best time to divide your clumping perennials, too. In a previous article I wrote about sharing your garden with friends and family. This is a great opportunity to have a plant swap or just to say thanks for being there. Dividing plants is also healthy for them and helps to maintain their size and spread. Planting and transplanting shrubs and trees can be done now just before the plants go into dormancy. However, some trees do not like being dug out of the ground, as it can be too stressful. This is mostly a concern for nurseries when they go to “ball & burlap” a tree that has been growing in the ground: the act of injuring and pruning the roots is too much for the tree to take before going dormant. Ask your nursey about this when selecting trees—they usually have a list available that warns customers of these concerns. A potted or containerized tree should be fine if planted in the fall. Their roots will not be damaged or impacted when transplanting from the container to the ground. Just make sure they are not root-bound or girdling (encircling the tree inside the container). Finally, don’t forget to feed your garden. Autumn is an excellent time to add a light layer of compost. By doing this now, it gives you some extra time in the spring since you will not have to work the soil as much. Leaf litter makes a good mulch as well and it will help provide protection to some beneficial insects as previously mentioned. Just make sure there are no diseased leaves among the the litter. 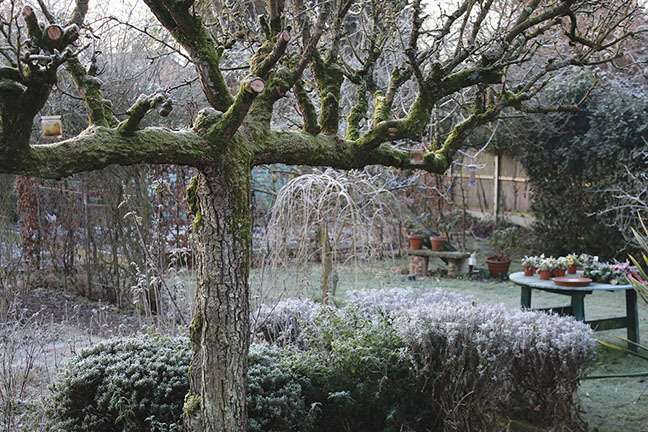 I hope I have changed your outlook on the winter landscape and that you may try some alternative practices this year, helping both your garden and wildlife mature into next year’s bounty and enjoyment.